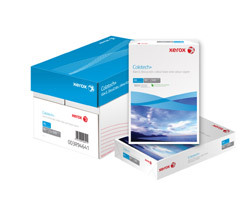 Xerox Exclusive is the perfect Xerox paper for prestigious documents. It is ideal for letterheads, proposals or presentations. The excellent bulk, stiffness and very high whitness of Xerox Exclusive is designed to give a proffesional touch to your documents. Available in A4 and A3 size and 80gsm. 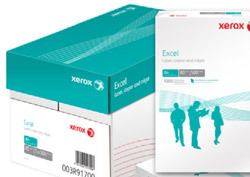 Xerox Excel is the perfect Xerox paper for prestigious documents. It is ideal for letterheads, proposals or presentations. 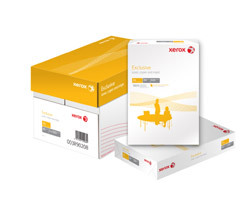 The excellent bulk, stiffness and very high whitness of Xerox Exclusive is designed to give a proffesional touch to your documents. Available in A4 and A3 size and 80gsm. 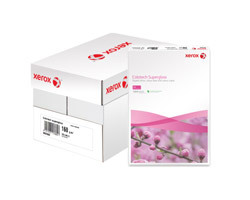 Xerox Premier paper range is simply the largest range of optimum paper available from Xerox. Xerox Premier is a totally versatile paper featuring lighter weights for mailing applications, higher weights for reports and proposals. All products are manufactured using non chlorine bleach and from sustainable sources, meaning that you may not need another office paper. A4: 60, 80, 90, 100, 160, 200gsm A3: 80, 90, 100, 160gsm. Xerox Performer is a multipurpose paper that offers reliability combined with excellent value for money. 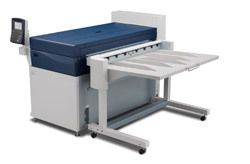 A consistent and reliable product suitable for all copying and laser printing applications. It is also ideal for use on plain paper faxes. Available in A4 and A3. Colotech+ Gloss Coated - A 2 side coated paper with an ultra smooth gloss surface. The bright white shade gives enhanced image sharpness and colour brilliance. The ultimate print media for digital colour printers. Colotech + Silk coated - A 2-side silk coated paper which offers near offset print quality from your digital printer. The low gloss finish produces beautiful images and crisp text. Colotech + Supergloss - A 1-side cast coated paper with an ultra high gloss finish. It is ideal for producing superb photo quality images. Xerox Recycled paper is made from 100% Post-Consumer waste. De-inked without bleaching and free from optical brightening agents. For general use on all laser printers and copiers. Awarded the Nordic Swan for low emissions during production. Awarded the Blue Angel environmental label. Wrapped and packed in recycled material. Wide Format- PPC Reprographic: High quality plain paper for cost-effective everyday plans copying and printing requirements. Good whiteness, body and formation. CAD Inkjet Media: A full range of media for CAD engineering drawing, suitable for printing on all CAD inkjet printing devices. Aqueous Inkjet: Highest quality papers in a variety of specifications and finishes to produce colour graphics prints for a wide range of applications. Solvent Inkjet: A full and extensive range of solvent inkjet medias, including Outdoor Papers, Lightstop Display, Adhesive Vinyl and Banner Display products.